The British government must offer assurances that weapons manufactured by UK arms firms are not being deployed in Saudi Arabia’s airstrikes against Yemen, the Campaign Against Arms Trade (CAAT) has warned. As part of a military intervention launched last week, the Saudi government is conducting airstrikes in war-torn Yemen along with Jordan, Bahrain, the United Arab Emirates, Kuwait and Qatar. Saudi Arabia’s King Salman has reportedly set aside 100 fighter jets and 150,000 soldiers for use in the military offensive. Saudi Arabia is estimated to be Britain’s most prolific weapons buyer. Since coming to power in 2010, the UK’s Conservative-led government has licensed in excess of £3.8 billion worth of arms to the Gulf regime, according to CAAT. Britain sells a range of arms to the Gulf state, including the Eurofighter Typhoon aircraft. It also maintains other arms for the Saudi regime such as the F-15 combat aircraft and the Saudi Tornado fleet. Amnesty International previously concluded it was “extremely likely” that UK-supplied Tornado fighter-bombers were used in a Saudi-led military offensive against Yemen in 2009. Sprague warned that UK arms sales should not undermine international human rights law. He called upon the British government to conduct an inquiry into the role UK arms played in the Saudi government’s military assault on Yemen in 2009. Despite Amnesty’s demand, no such inquiry was ever conducted. Britain and Saudi Arabia’s military trade relations have remained extremely lucrative. Yemen has spiraled into conflict between several key groups in recent months, pushing the nation to the precipice of civil war. As opposing forces fight for control of the Middle Eastern state, tensions continue to rise. Analysts suggest the power struggle in Yemen holds serious implications for the Middle East, and the security of the wider West. Conflict in the region has been described by critics as a proxy war between Shia Iran and a number of Sunni Arab nations. In a bid to take control of large swathes of Yemen, Houthi rebels ousted the country’s president and destabilized its Saudi-supported government last week. 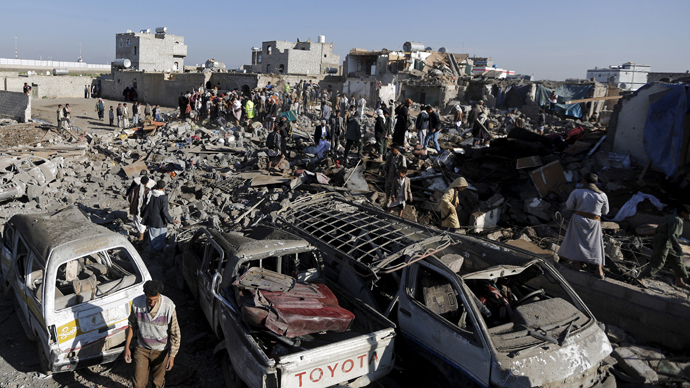 The Saudi government subsequently assembled a coalition to militarily intervene in Yemen. Reflecting on escalating tensions in Yemen, Andrew Smith of CAAT called upon the British government to offer assurance that weapons manufactured in the UK are not being deployed in Yemen. “UK weapons have been used by Saudi Arabia in Yemen before, in a bombardment that resulted in civilian deaths,” he said. CAAT warns that successive British governments have offered financial and practical support to Saudi Arabia’s autocratic regime. “Selling arms to the Saudi government sends the message that the human rights of the Saudi people are of lesser concern than the commercial interests of BAE Systems,” it said.